You know what it takes to make me want to hit the unsubscribe button these days? 32.1 miles. 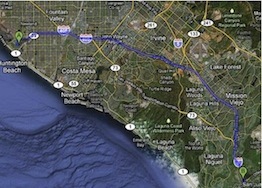 That’s the distance between Huntington Beach, CA and the beautiful city of San Juan Capistrano. Today I'll use a personal anecdote (and a tasty temptation) to illustrate how a strategic email marketing tactic can backfire if exercised in an un-strategic way. I remember walking 25 minutes in the snow from world famous Giardano’s back to our hotel and opening up the box to still piping hot, incredible pizza pie! I even left to go out for more than a few hours, came back and enjoyed that last slice more because somehow it had gotten better sitting in the box on the counter all night. Whoa, sorry, I think I was dreaming for a second, because I woke up chewing my pillowcase. Okay, whatever. If there’s a great Chicago style pizza within sniffing distance, I’m in. The question is: what exactly is sniffing distance? For that matter, what’s an acceptable drive for good pizza? What’s an acceptable drive for $15 off good pizza? The pizza place in the email (Vito’s) is exactly 32.1 miles away from me. And even though San Juan Capistrano is an amazingly beautiful city, Vito’s might as well be in Chicago because I won’t be in either of those cities tonight. Listen, email list segmentation of a zip code is a great thing, but not if it doesn’t make sense for the recipient. If I get a coupon for a few thousand off of a new car, a 30 mile drive is nothing. But it just doesn’t work for pizza. 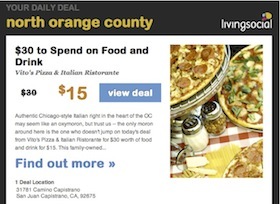 I wouldn’t blame Vito’s Pizza shop for this (I’m sure they just signed up for this email blast and didn’t do the segmenting themselves), but I don’t need to hear about a food deal that isn’t in my local neighborhood. How about something in a city that at least borders my hometown? I Wonder Who Hit the Unsubscribe Button? So what’s my tolerance for this kind of mis-segmentation? Hmmmn, not too much, I guess. But the emails from Living Social do look very delicious, so I guess I won’t hit unsubscribe just yet. A well laid out email is always welcome in my inbox, so I’ll hang on for just a few more weeks. But I need to look at emails to have something to write about. Your average customer doesn’t. All is not lost though. Next time I’m visiting the mission in San Juan Capistrano, I’ll look up Vito’s Pizza. I’ll even pay full price.